The humble yet cheerfully attractive daisy is familiar to most people as a weed of lawns and as a feature of children's games. Daisy is a perennial plant, and flowers for much of the year. The plant was described by Chaucer as the 'day's eye', and 'the emperice and flour of floures alle'. 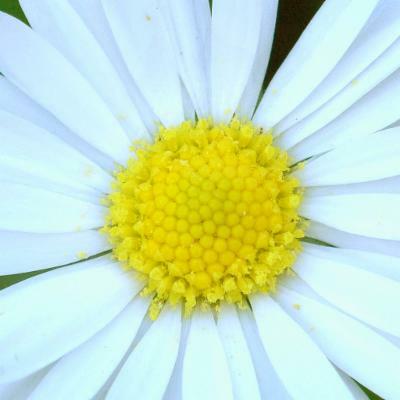 Daisy is a perennial plant, and flowers for much of the year. The upturned flower heads look like single flowers, but actually consist of a number of small, tightly packed individual flowers or 'florets'; this arrangement is a type of inflorescence known as a 'capitulum'. 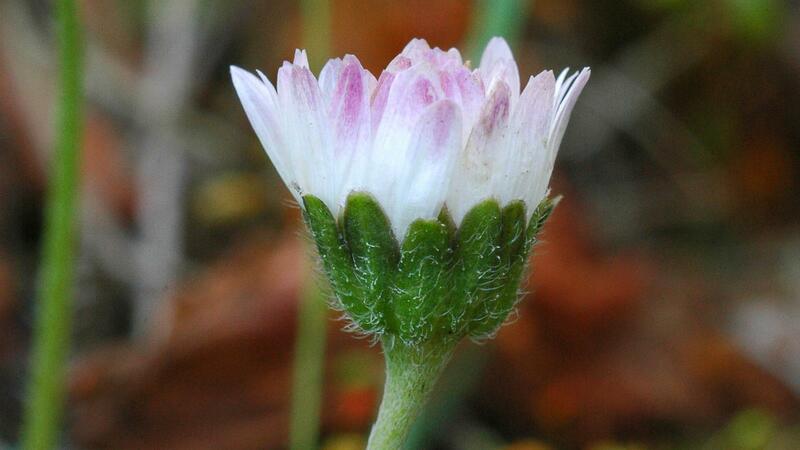 The capitula open at dawn, are visited by many small insects, and are also used by children to make daisy chains. The plant was described by Chaucer as the 'day's eye', and 'the emperice and flour of floures alle'. 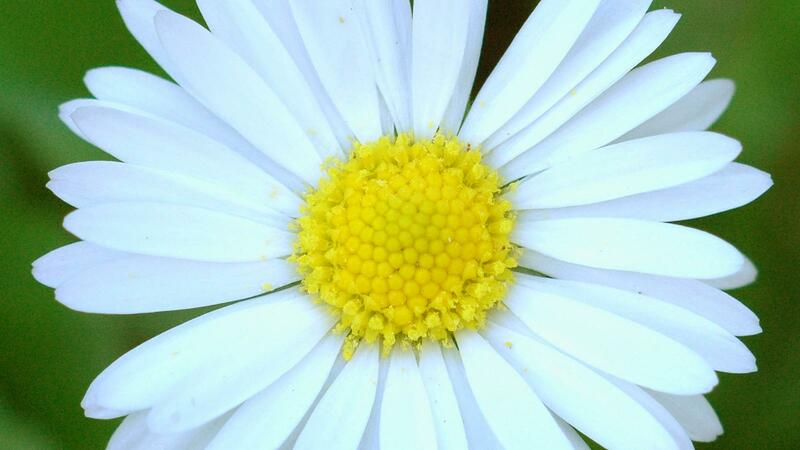 Daisy is common throughout Britain. It also occurs throughout the rest of Europe and west Asia. Leaves: The small, hairy, spoon-shaped leaves, which are green throughout the year, make up neat, flat rosettes. Flowers: The upturned flower heads look like single flowers, but actually consist of a number of small, tightly packed individual flowers or 'florets'; this arrangement is a type of inflorescence known as a 'capitulum'. The flower heads have bright golden-yellow central discs, composed of 'disc florets', which are surrounded by petal-like white 'ray-florets' that often have deep pink or reddish flushes on the underside. 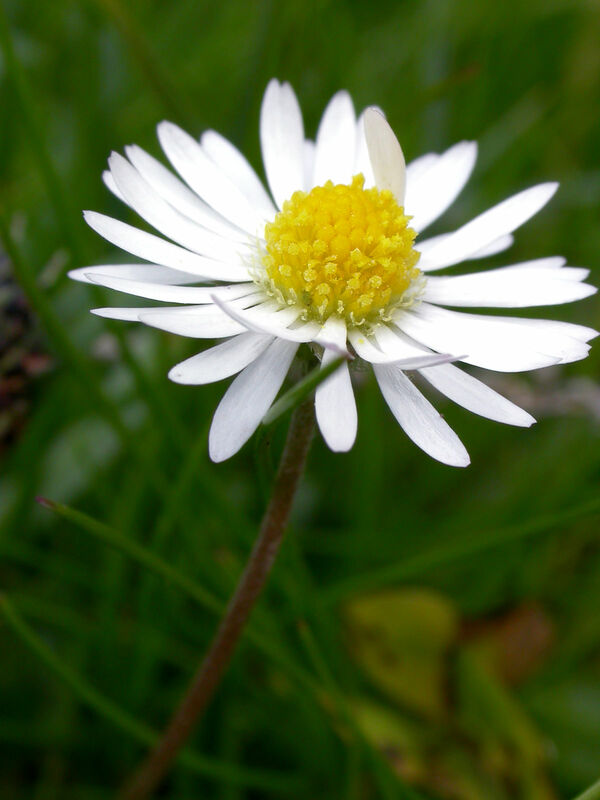 Although often considered to be a weed of lawns, Bellis perennis is a valuable addition to grassland areas managed for wildflowers and wildlife. There are many compact cultivars which are used for ornamental bedding displays. The medicinal properties of daisy were recorded as far back as Gerard's Herbal in the 16th century. The flowers and leaves can be used fresh in decoctions, ointments and poultices for treating wounds and also boils. A mild decoction of the flowers may ease complaints of the respiratory tract, including coughs. An ointment made from the leaves can be applied externally to wounds and bruises. Although somewhat acidic to taste, the leaves are edible. These can be used as a pot herb or added to salads. Daisy is usually considered a weed of lawns but in an informal setting it can create a pretty addition to short grass areas. Most cultivation advice for this species concentrates on how to remove it from a lawn - by spraying with herbicide or digging up plants, with their roots, and removing them. 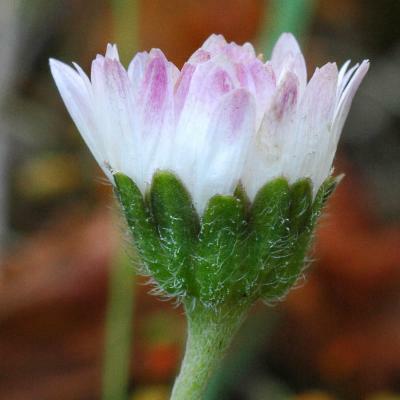 Daisy will usually appear in a lawn without any help and mowing the grass every two or three weeks will keep it short enough for daisy to survive and flower. It survives the cut of the lawn mower by having compact, ground-hugging rosettes of leaves. Adventicia en Colombia; Alt. 2600 - 2800 m.; Andes. 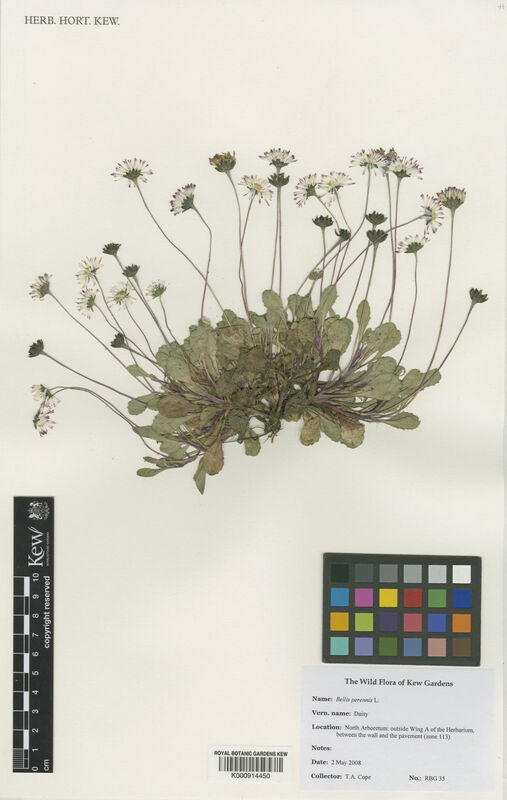 Bellis perennis f. discoidea D.C.McClint. Erigeron perennis Sessé & Moc. Pruski, J.F. (ed.) (2018). Flora Mesoamericana 5(2): 1-608. Universidad Nacional Autónoma de México, México, D.F. Wu, Z. & Raven, P.H. (eds.) in Flora of China Editorial Committee (2011). Asteraceae Flora of China 20-21: 1-992. Science Press (Beijing) & Missouri Botanical Garden Press (St. Louis). von Raab-Straube, E. (ed.) (2011). 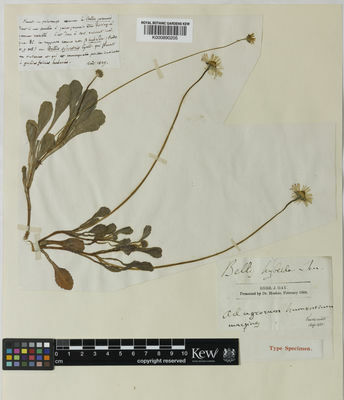 Compositae. Euro+Med Plantbase The Euro+Med PlantBase - the information resource for Euro-Mediterranean plant diversity http://ww2.bgbm.org/EuroPlusMed/query.asp. Flora of North America Editorial Committee in Flora of North America Editorial Committee (2006). Asteraceae Flora of North America North of Mexico 20: 1-666. Oxford University Press, New York, Oxford. Bown, D. (2008). The Royal Horticultural Society Encyclopedia of Herbs and their Uses. Dorling Kindersley, London. Mabberley, D. J. (2008). Mabberley’s Plant-Book: A Portable Dictionary of Plants, Their Classification and Uses. 3rd edn. Cambridge University Press. Preston, C. D., Pearman, D. A. & Dines, T. D. (2002). The New Atlas of the British and Irish Flora. Oxford University Press, Oxford. Mabey, R. (1996). 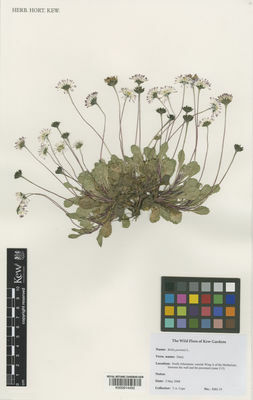 Flora Britannica. Sinclair-Stevenson, London. Press, B. & Gibbons, B. (1993). Photographic Field Guide to Wild Flowers of Britain and Europe. New Holland Publishers (UK) Ltd, London. Huxley, A., Griffiths, M. & Levy, M. (eds) (1992). The New Royal Horticultural Society Dictionary of Gardening, 4 vols. Macmillan, London. Clapham, A. R., Tutin, T. G. & Moore, D. M. (1987). Flora of the British Isles. 3rd edn. Cambridge University Press, Cambridge. Usher, G. (1974). A Dictionary of Plants Used by Man. Constable, London. Hedrick, U. P. (ed). (1919). Sturtevant’s Notes on Edible Plants. New York (State) Dept. of Agriculture, 27th Annual Report, Vol. 2 Part II. Lyon, Albany. Gerard, J. (1633). The Herbal; or General History of Plants. The complete 1633 edition. Dover, New York. National Biodiversity Network Species Dictionary (Feb 2003). Kharkevich, S.S. (ed.) (1992). Plantae Vasculares Orientalis Extremi Sovietici 6: 1-428. Nauka, Leningrad.